It was with excitement and a large amount of pride that several of the LGBT choirs of Asia gathered for ‘Hand in Hand’, the continent’s first LGBT choir festival. Between 30 October and 1 November 2015, choirs from China, Japan, Singapore, South Korea, Taiwan and internationally met in Taipei to celebrate singing and community, and in the process made friends and learnt from each other. The event was the brainchild of Proud Voices Asia, the network of Asian LGBT choirs, and put together with the expertise of our hosts, G-Major Chorus Taiwan. Asia is a hugely diverse place, not just in terms of geography, but also linguistically and culturally, and the festival represented this variety. From Taiwan to China, from South Korea to Japan, the individual choirs reflected old partnerships as well as frictions, but all differences melted away in the shared love of vocal performance. At Proud Voices we believe that all LGBT choirs share three things in common: music, community and Pride. Each of these aspects reinforces the other, and the combination of them sets our choirs apart from more conventional choruses. All three components were very much on display in each of the choirs who took part in ‘Hand in Hand’. Where the choirs differed was in the extent to which each was expressed, and this in turn depended upon the experience of being LGBT in each of the different countries. For instance, in the more LGBT-friendly environment of Taiwan, G-Major has flourished with a strong musical tradition and a strong LGBT identity, reflected in a proud performance and choice of gay themed songs. In contrast in countries such as Singapore where, despite being relatively progressive, being gay is still illegal, the focus of the Sing Men’s Chorus has been on excellence of musical sound and internal community building. In South Korea where the choirs use music to raise social awareness, the youthful G_Voice and Unnie Choir sang about transgender issues and women’s rights. 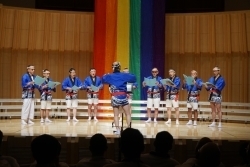 In Japan, where being gay is not illegal, but there are intense social pressures against it, Men’s Voice Kansai performed traditional folk songs, while building a friendly, mutually supportive community of singers. 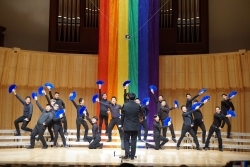 It was even educational for the three Chinese choirs who participated – Beijing Queer Chorus, Chengdu Wutong Gay Men’s Chorus and Shanghai Hyperbolic Singers – to have the opportunity to sing with each other, as it highlighted the differences within this large country in the attitudes between the more conservative administrative capital and the socially liberal financial capitals. 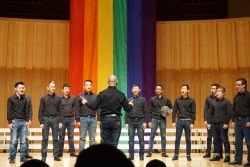 For the GAPA Men's Chorus from the U.S., it was a chance to connect and share both the Asian and LGBT aspects of their identity with like-minded people. Besides being a friendly and open environment where singers could mingle, the festival demonstrated the possibilities for the LGBT community in an Asia which is often described as being traditional and conservative. 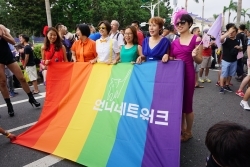 In addition to singing and socializing, the choirs took part in Taipei Pride, the largest Pride march in Asia. They were also joined by the Proud Voices scratch choir, made up of choirs from the U.K. – the Barberfellas and the Pink Singers – and friends from Ireland, the U.S.A. and Canada. ‘Hand in Hand’ brought us all together in the spirit of friendship and emphasized that choral singing, being LGBT and the communities that develop around both are shared, universal experiences. Here, in their own words, are a few thoughts on the festival from some of the participants. “Because this was the very first time I had ever participated in an international LGBT chorus festival, and my choir — Taipei’s G-major — was the very first host of Hand in Hand, I was both extremely proud and excited. I was also very nervous, worrying that we hadn’t considered all eventualities. Yet, after 3 days' events, it is great to have made LGBT friends from all over the world. I tried my best to communicate with my limited English, and now realize the importance of English as an international common language. But music is another common language: with music, we had the opportunity to understand cultural differences from all across the world. I was so impressed by the diversity and possibilities of the music in the festival. “It was over a year ago when the idea of going to Taiwan for the first Asian Hand in Hand festival was mentioned. The thought of going to another country which I knew nothing about and being able to participate in something so monumental was enough to make me sign up instantly. I'd already met and sang with some members of G-Major and the Beijing Queer Chorus at the Various Voices Festival in Dublin 2014 and thought they were lovely and couldn’t wait to be part of their festival. The welcoming event was so much fun, we met the other choirs, ate the most amazing food, enjoyed some brilliant entertainment and sang together (what a surprise!). The magic had already started and we all couldn’t stop smiling and we topped the evening by dancing and singing the night away. When it came to the festival we had already formed friendships between choirs after marching in Taipei pride the day before so when it was time to take turns to perform for each other and the public, everybody was so welcoming and we all felt very proud of each other. The standard of singing was fantastic, each choir with their own style and choice of music. G-Major topped the festival off with a superb concert; wonderful singing, staging and energy. Following a standing ovation, we finished with all the choirs on stage singing ‘Hand in Hand’ and all diving together for an epic selfie. “Hello, this is Owen! I sing in G_Voice and we attended Hand in Hand 2015. The performance in Hand in Hand was full of excitement. I would like to say “thank you” to G-Major for hosting the event which had us gather and gave us the opportunity to meet other LGBT choirs for the first time. Why do we sing? I think, it is because we can feel solidarity by singing together. I felt the excitement of being on stage while singing, and I can sing these songs as my real self which the audience in front of me also acknowledged. We, the choirs, become one throughout singing and all of us showed our talents so beautifully. At Hand in Hand 2015, we laughed, chatted, danced and sang together.